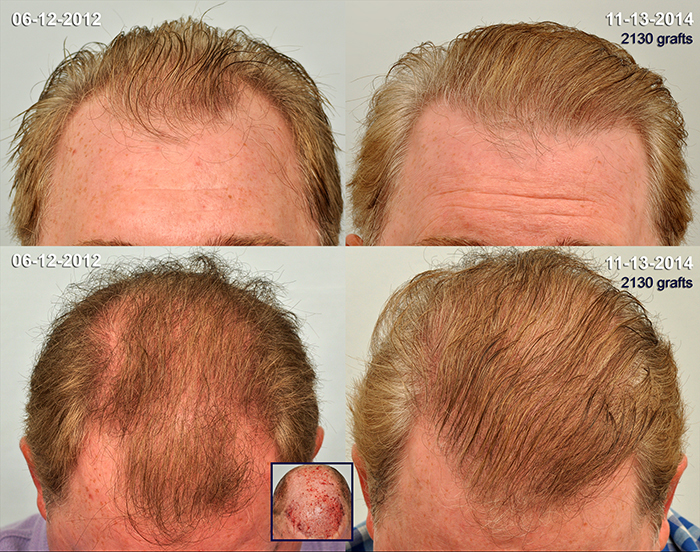 Our patient, came to us in June of 2012 to address some recession and add density behind his hairline. Very pleased with his growth from his first surgery, our patient is back today, (11-13-2014) for 2.000 more grafts to provide additional density to his crown. In 2012 he definitely had the balding look. Today before his second procedure he only appears slightly thinning. After a year, the 2,000 grafts placed today, should come close to eliminating the impression of a thinning head of hair. His natural hair color works to his advantage because there’s not a lot of contrast between hair and scalp.